Rocket Matter Knowledge Base Billing by Matter How to delete a payment. 2. Click on the 'Matter Ledger Balance' located on the right- hand side on your matter dashboard. 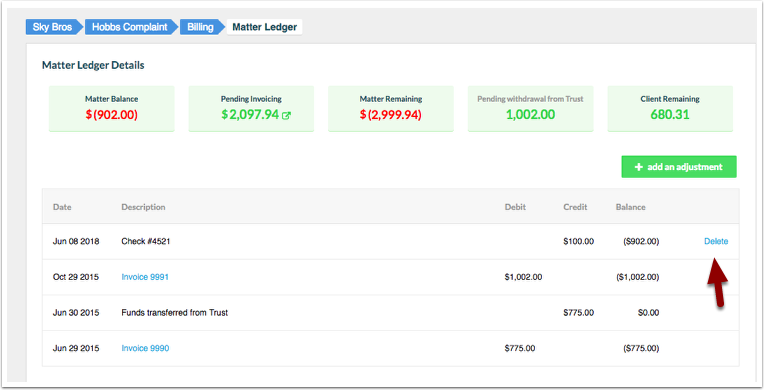 From the matter ledger you will be able to view the latest payments that have been entered for that matter. 3. Simply click on the blue 'delete' button to delete your payment. Note: If there have been other entries made on the ledger after the payment you want to delete, you must delete the most recent entry first. Once the most recent entry has been deleted, the screen will refresh and allow you to delete the next line item, if applicable.